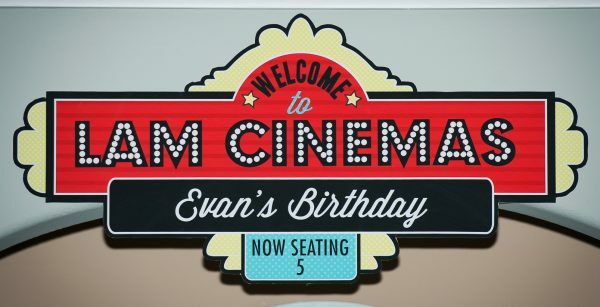 For Evan’s 5th birthday, we hosted a movie screening party. We purchased an outdoor movie screen that we placed in the backyard. Evan’s guests were the first to view our three short movies! 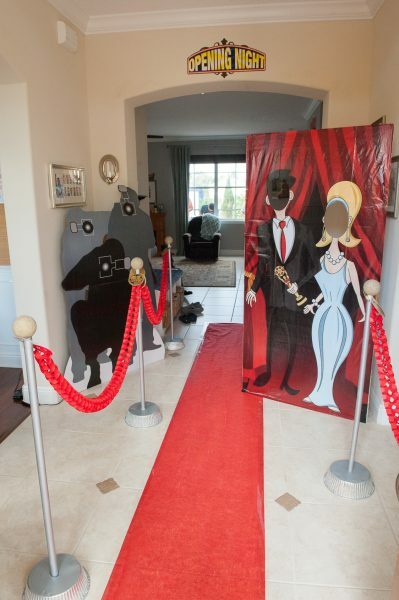 Some of the kids at the party were stars in the short movies; it was only fitting these stars walked the red carpet when they arrived to our party! 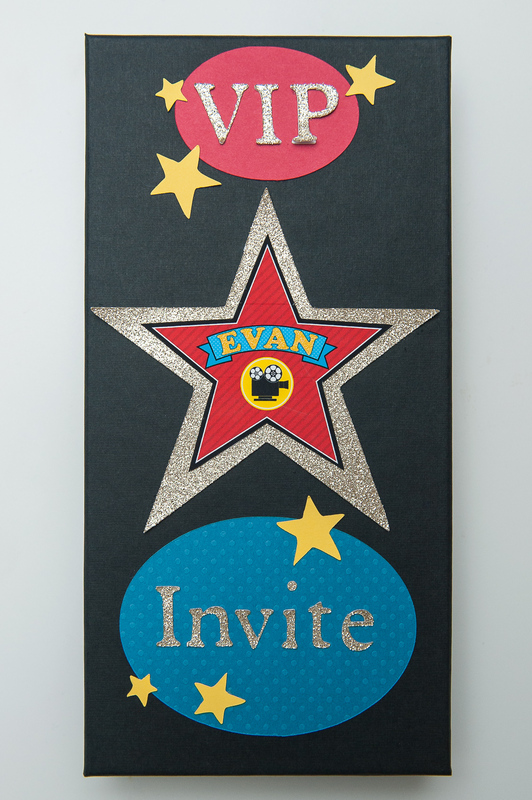 We created movie box invitations for Evan’s party. 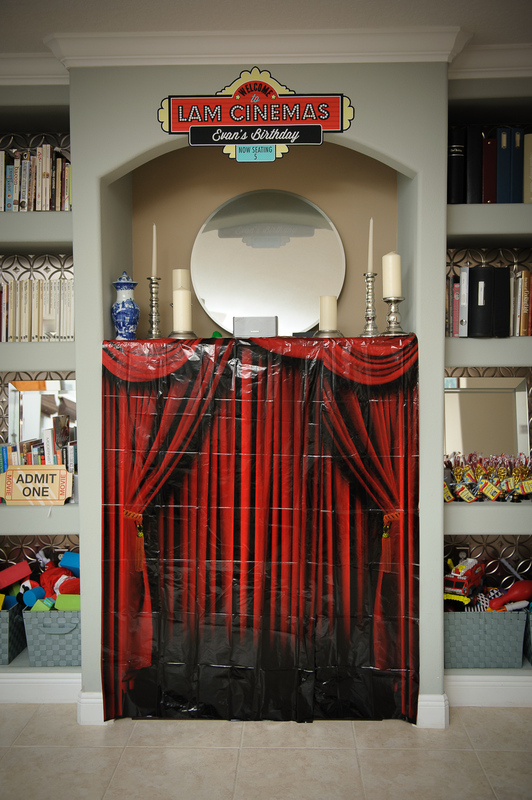 Each child received a movie box that contained a VIP movie pass and a DVD that featured a movie trailer for this party. 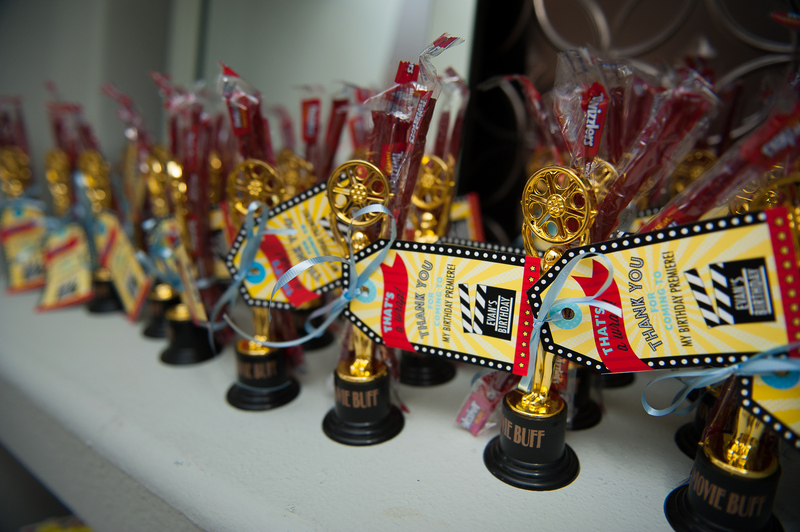 The guests wore their VIP movie passes to gain entrance into this exclusive party. 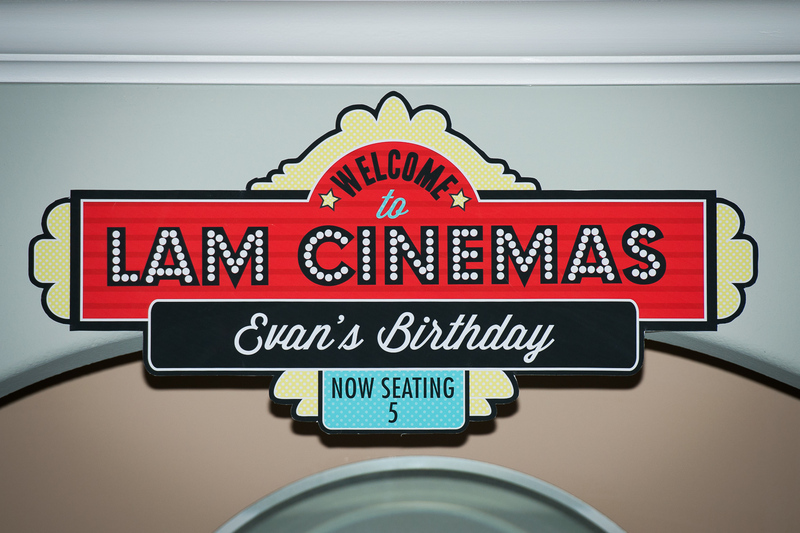 Enjoy the trailer for this Evan’s party! A VIP guest displays his pass! Curious about our color scheme? 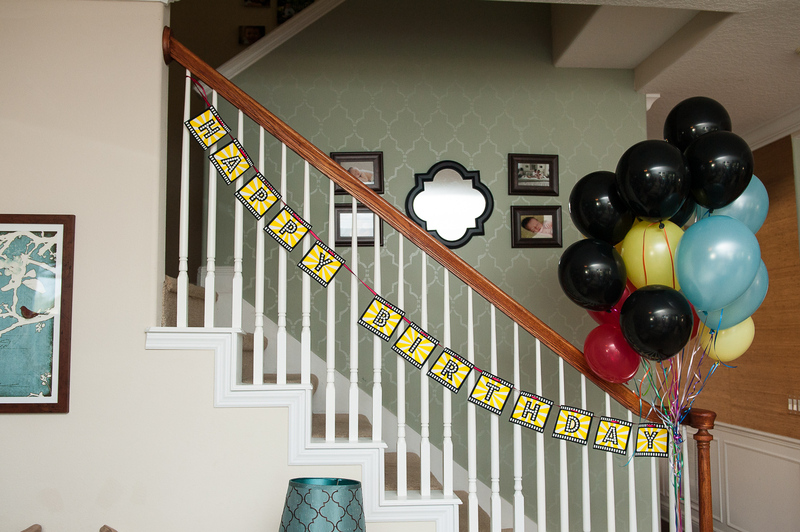 We used red, black, yellow, and blue with touches of gold for glamour. You can download the dazzling printables from the party here. Evan chose strawberry cupcakes (left) and chocolate fudge cake (right)! 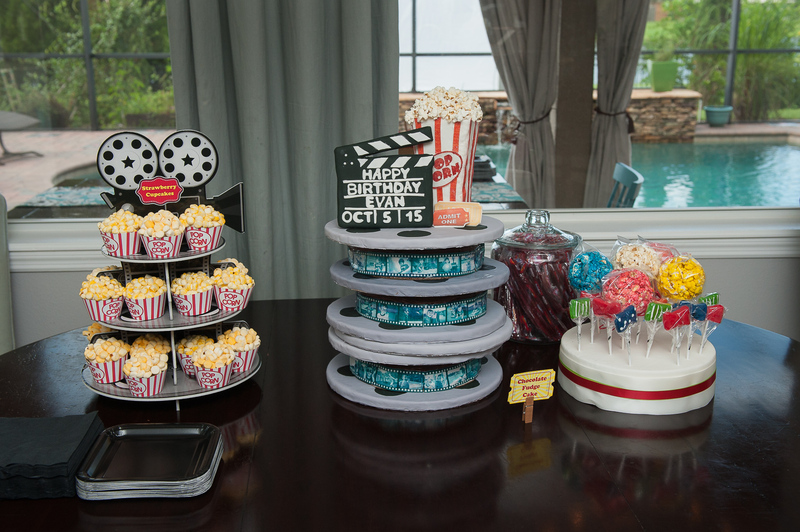 See the movie reels on the cake? They were cake boards (cardboard rounds used by bakers to serve the cake) covered in fondant we dyed gray and black. 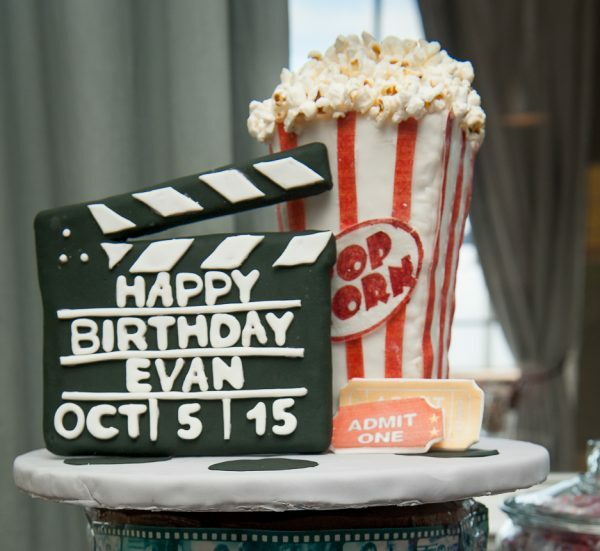 We printed out pictures of Evan from the previous year onto edible paper (check out the edible paper on Etsy here) and crafted them as if they were pictures on the reel. 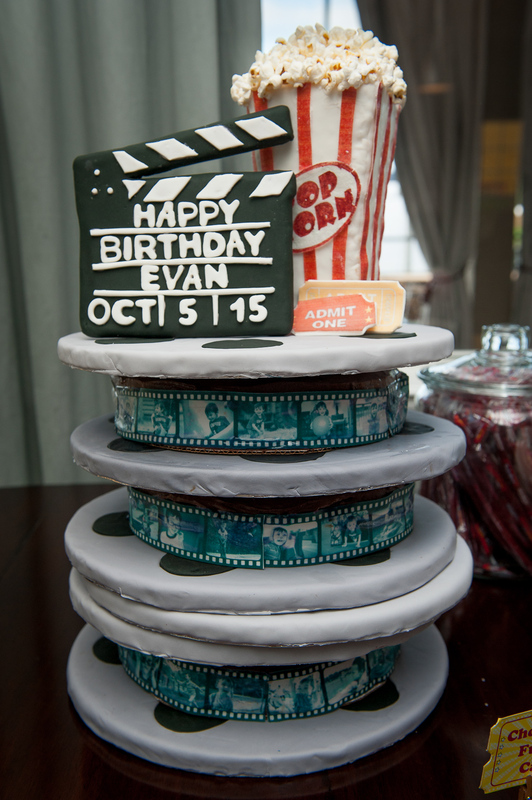 Single layers of cake were inside each reel. Besides the cake a jar of red Twizzlers in a glass jar also looks like the red carpet ropes. Strawberry cupcakes with strawberry buttercream! Then I put a layer of mini marshmallows on top of the strawberry buttercream. 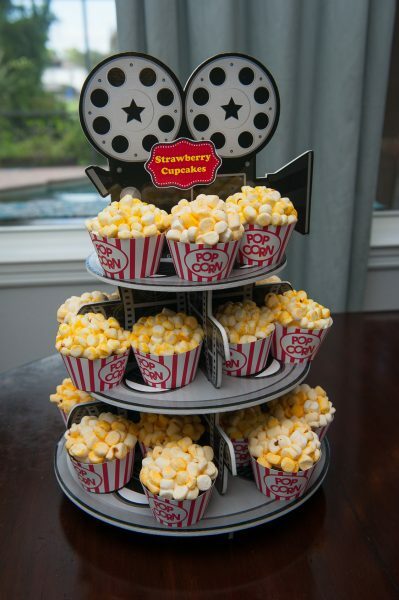 Make the marshmallows look more like popcorn by using yellow spray food coloring. Download these cute cupcake wrappers on Etsy here. 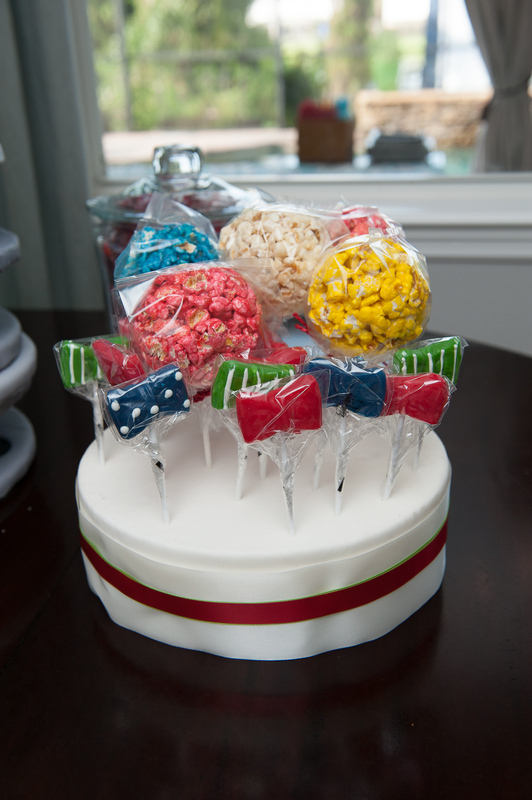 Pieces on top of the cake are edible cake toppers. 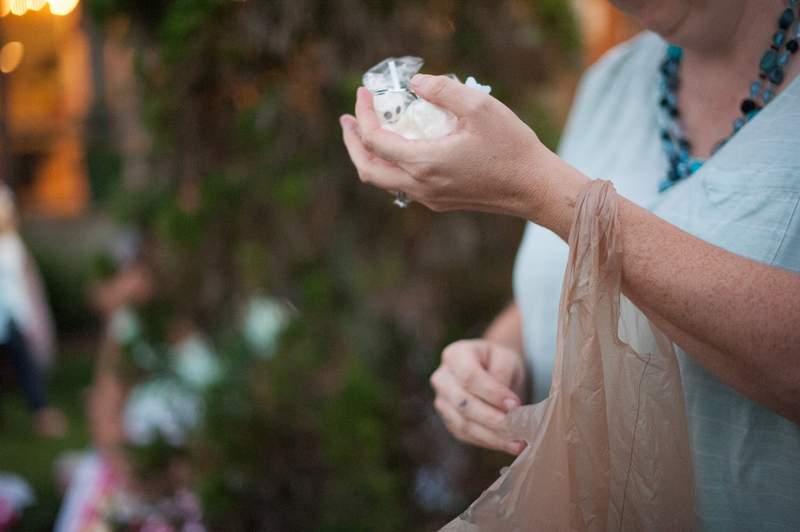 We made the popcorn by filling a plastic popcorn container with rice crispy treats (make sure you spray the popcorn container so it comes out easily). 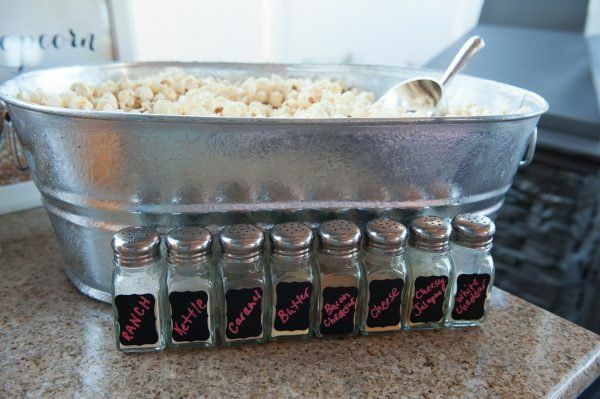 Let the rice crispy treats harden and remove them from the container. At this point you can cover it with fondant and decorate it with edible food coloring pens. We used edible glue to adhere real popcorn to the top of this creation. 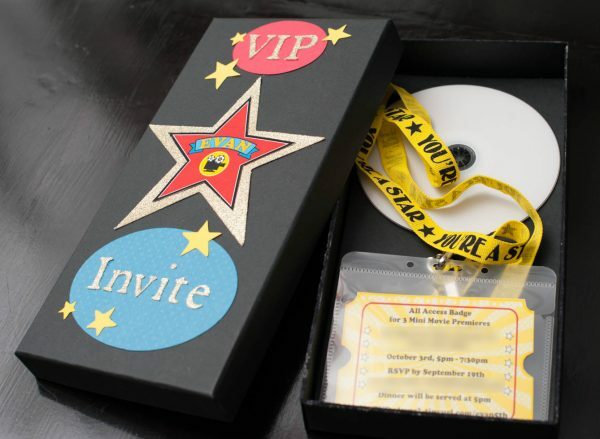 The tickets are fondant covered in printed edible paper. 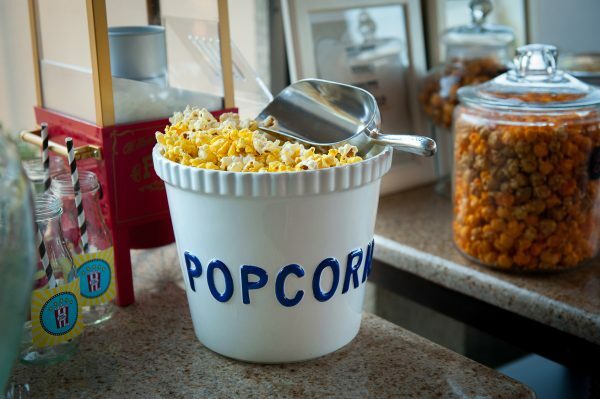 A local popcorn factory called Kernel Encore sells popcorn in a variety of fun and playful flavors! These were a great hit at the party. 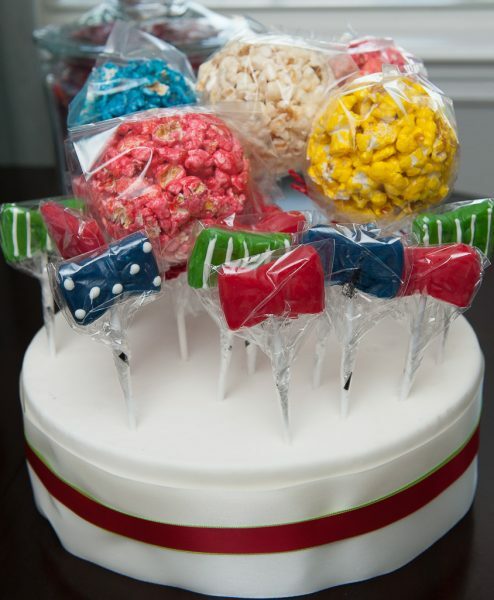 Adding lollipop sticks to the popcorn balls helped us insert them into the stand. In addition, we purchased bow tie lollipops for the front of the stand. You can find similar bow ties made of chocolate on Etsy here. Don’t… eat… these… carnations…, but aren’t they cute? We used a plastic popcorn container as the vase for carnation popcorn! Construct this sign out of foam poster board, paint, and letters cut out on my Cricut Explore Air 2. We also strung in lights so we could light up the sign at night. We were lucky to find this red warmer on Craigslist. 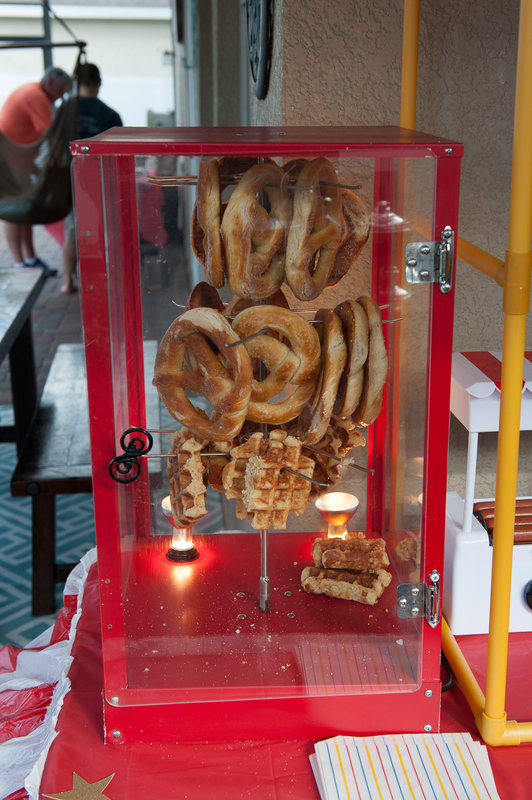 In the warmer we served pretzels with sea salt, pretzels with cinnamon sugar, and Liege waffles. A tiny slow cooker contained melted cheese for the sea salt pretzels and the chips (for nachos). 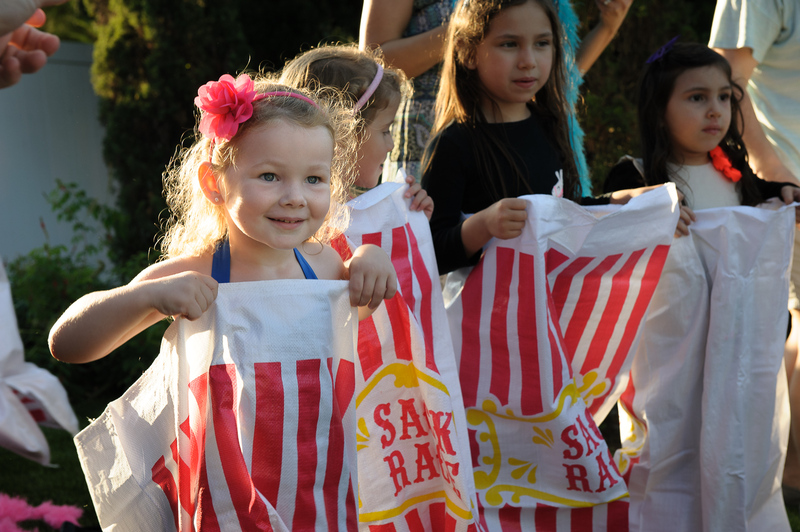 Of course, we had to have oodles and oodles of popcorn for our movie theme! 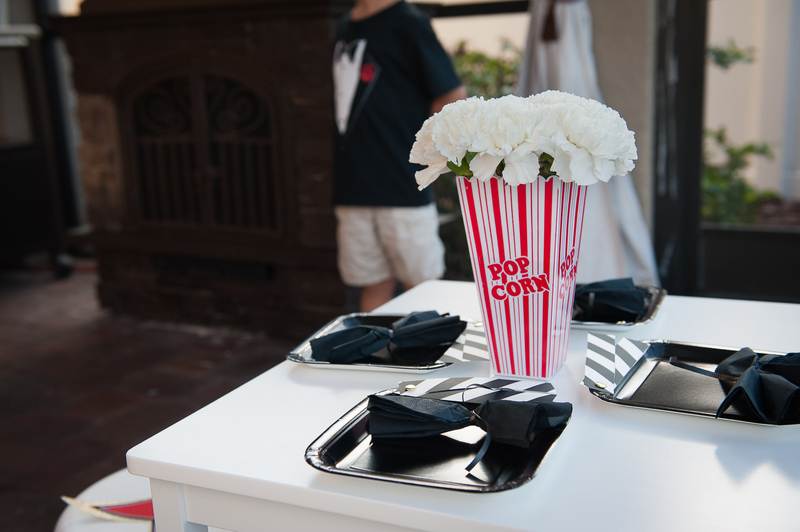 We served popcorn with butter, kettle corn, cheese popcorn, and homemade caramel corn. 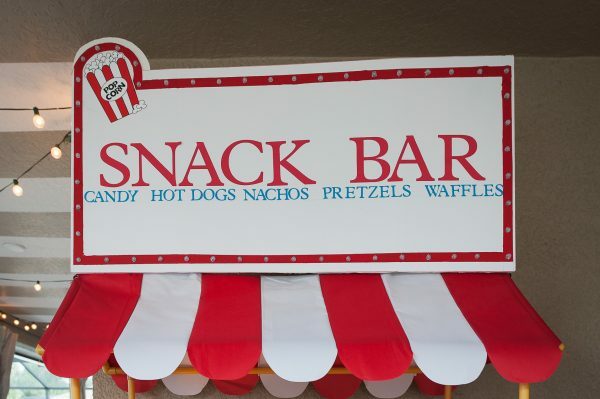 We found this cute sign for a popcorn bar on Etsy here. 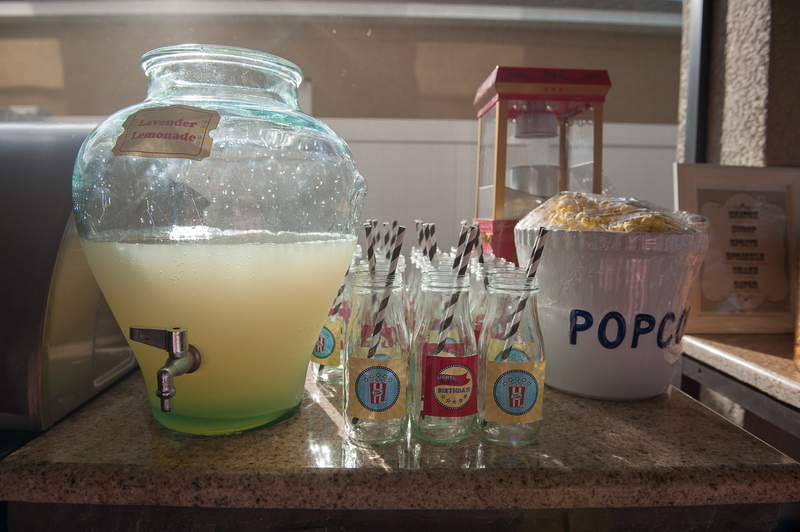 We had a popcorn bar with popcorn, butter spritz, and loads of flavored toppings. We found a printable on Etsy that explains to guests how to make their own customized popcorn here. Along with the other treats, we had this party catered by Pig Floyd Urban Barbakoa. If you’re in the Orlando area, you should plan a visit! We love their smoked chicken, sides and sauces, and we featured those items at the party. 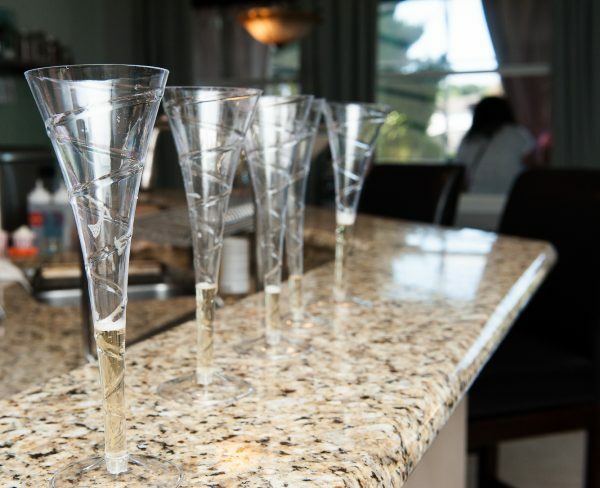 Every party needs a bit of bubbly! 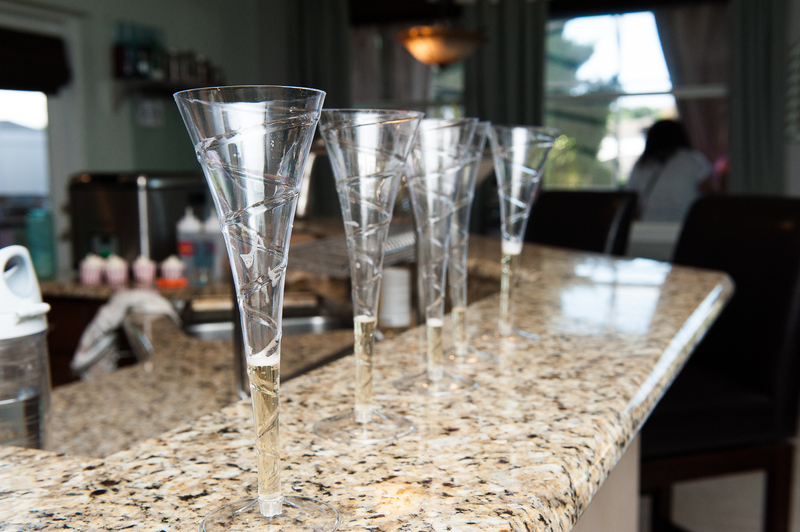 We found plastic champagne glasses and served sparkling apple juice in them. 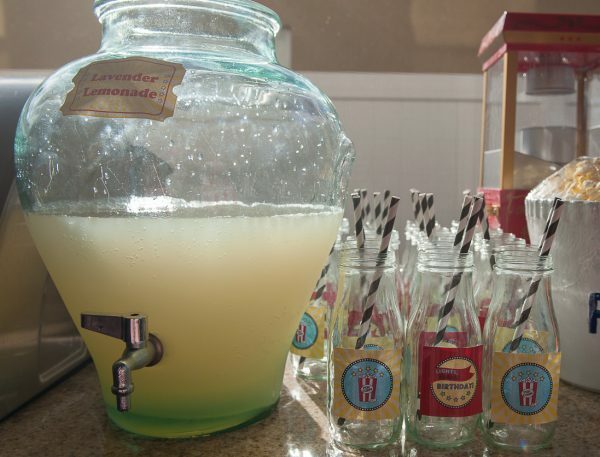 We also made a homemade lemonade with food grade lavender. We served this in my recycled Starbucks Frappuccino bottles. Open the front door and take a stroll on the red carpet! 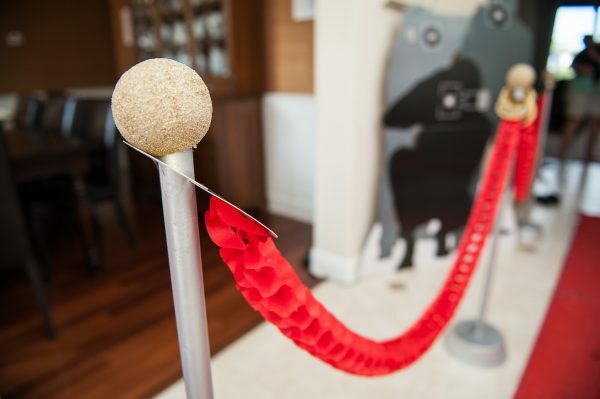 Be a Star For The Day on our red carpet! 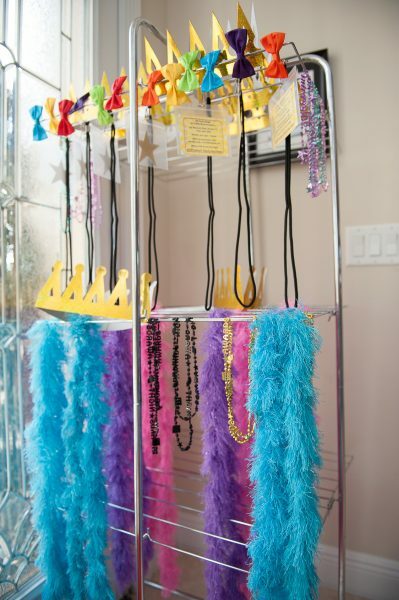 Strut your stuff after choosing fab accessories! 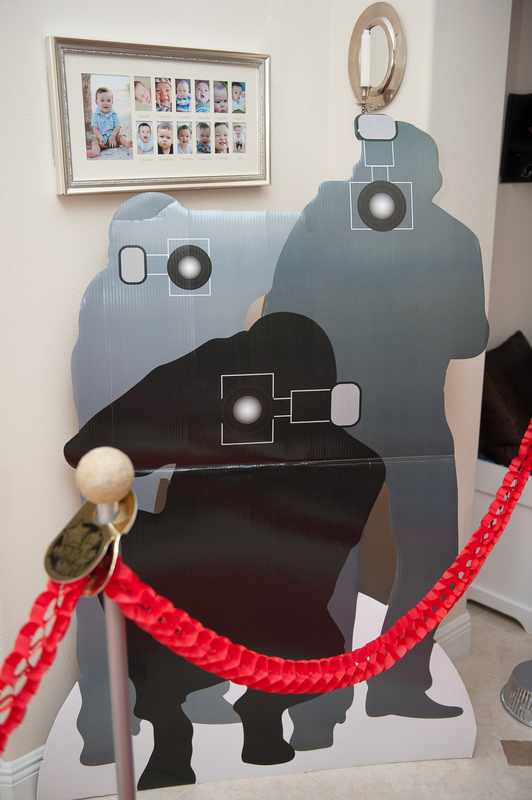 We had the paparazzi on our red carpet! 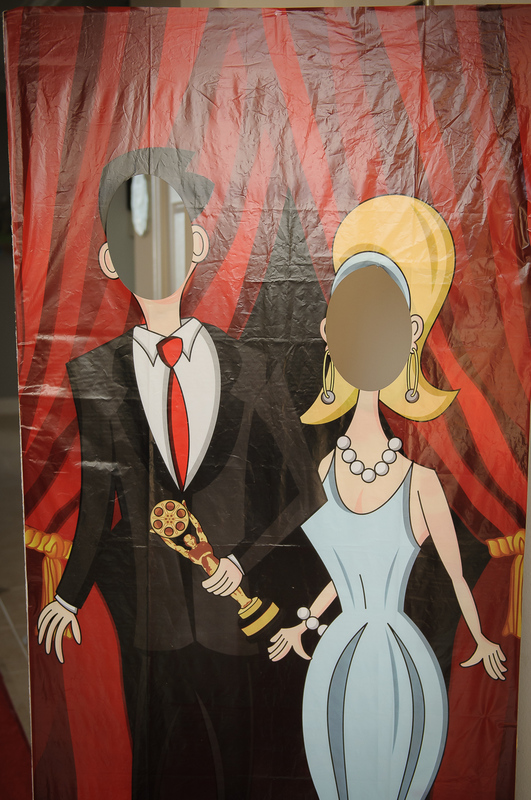 Hidden audio made flashing sounds that mimicked paparazzi on the red carpet. 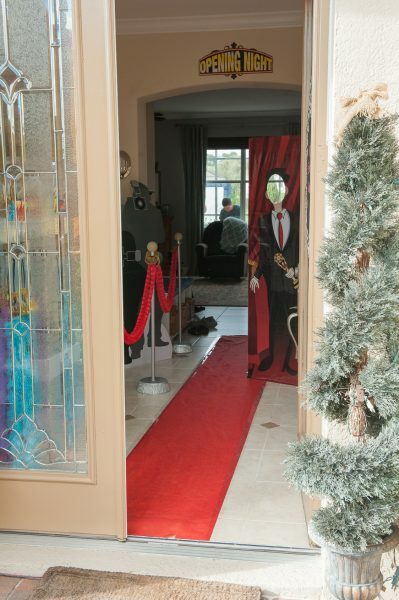 Want more red carpet feel? 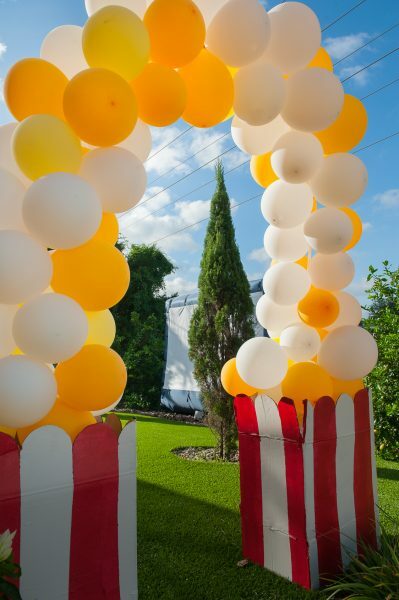 Create these poles by using pipes, styrofoam balls, pie tins and a wooden block! Cut the pipes to the height you would like the poles, and then spray paint silver. Spray paint the balls a sparkly gold color, and press them down into the top of the pipe. Cut a hole in the pie tins the size of the pipe, and insert the pipe in the pie tin. You will need to also cut a hole in a wooden block and stick the pipe in to stabilize it (under the pie tin). 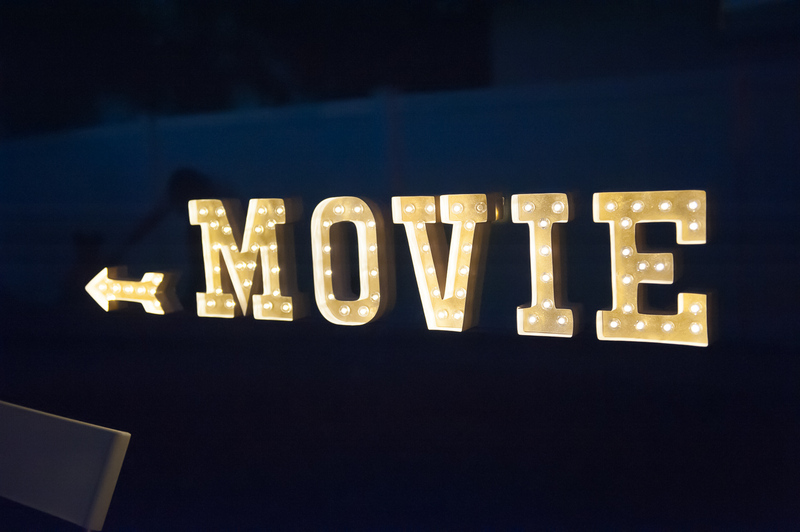 Check out the entrance to our outdoor movie! 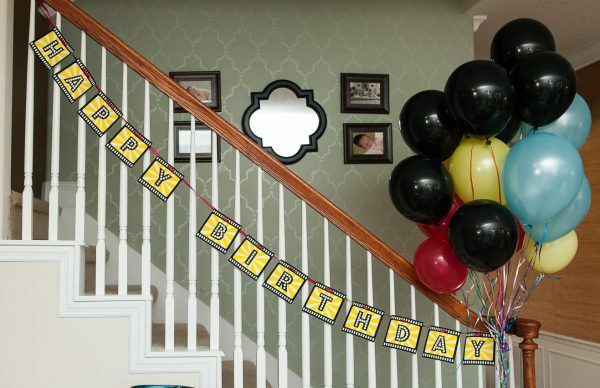 You can make these impressive balloon arches at home by purchasing a kit on Amazon! 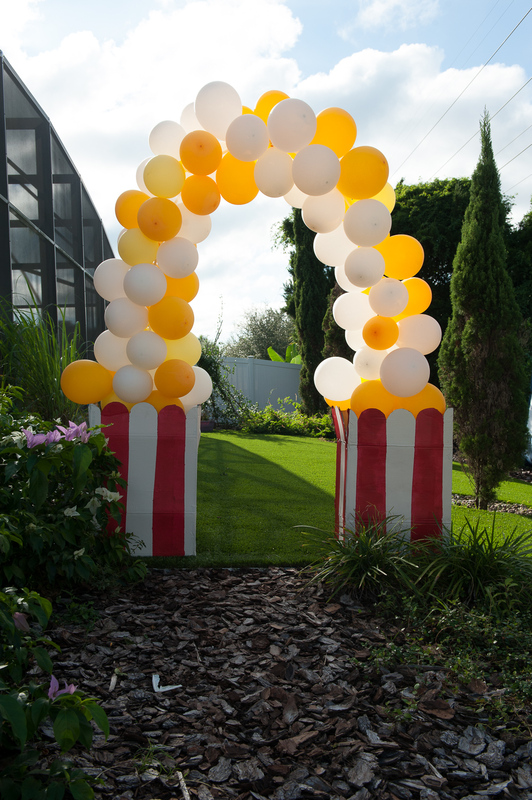 We purchased white and yellow balloons, a balloon arch kit, and placed the arch in popcorn buckets. We made the popcorn buckets by painting two large cardboard boxes. The scalloped tops were created using a half a circle stencil (use a disposable plate cut in half as your pattern). 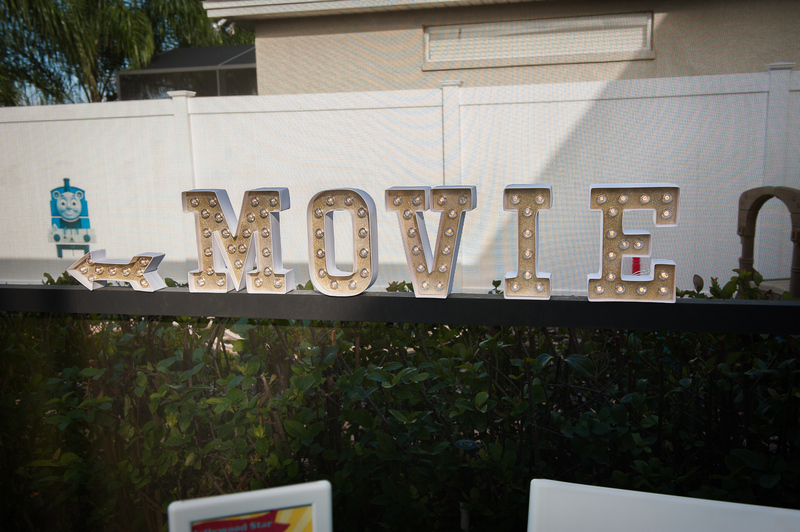 Using the same spray paint we used for the balls on the poles, we painted these marquee letters. This kit included removable sheets of paper you could paint and replace in the letters after the paint dried. We found this sparkly gold card stock paper on Amazon, and cut out large stars on my Cricut Explore Air 2. 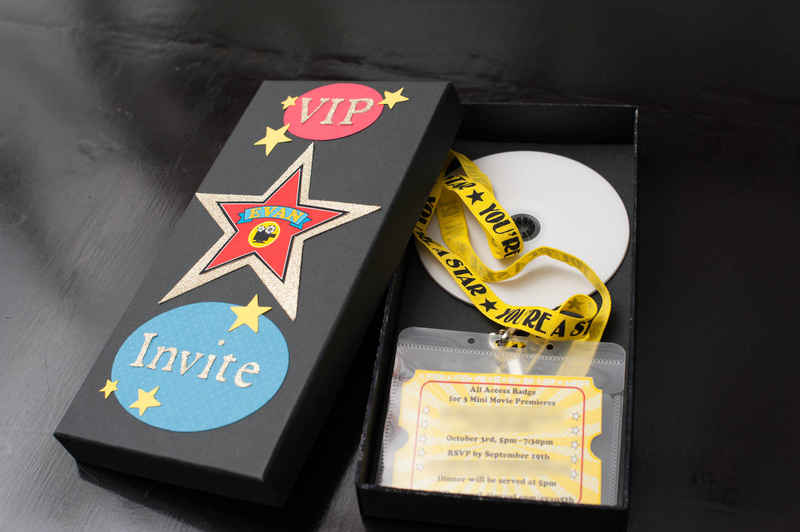 We then placed the stars from my printable package (see above) on top of the gold stars. 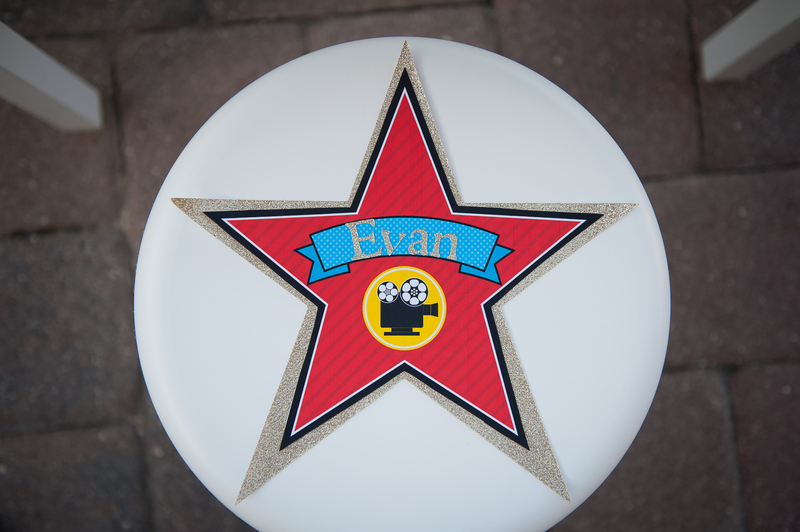 We cut out Evan’s name with the Cricut with the same gold paper and glued it to the printable star. We put this glitzy star on the birthday boy’s seat, and he sat there to enjoy his lunch. 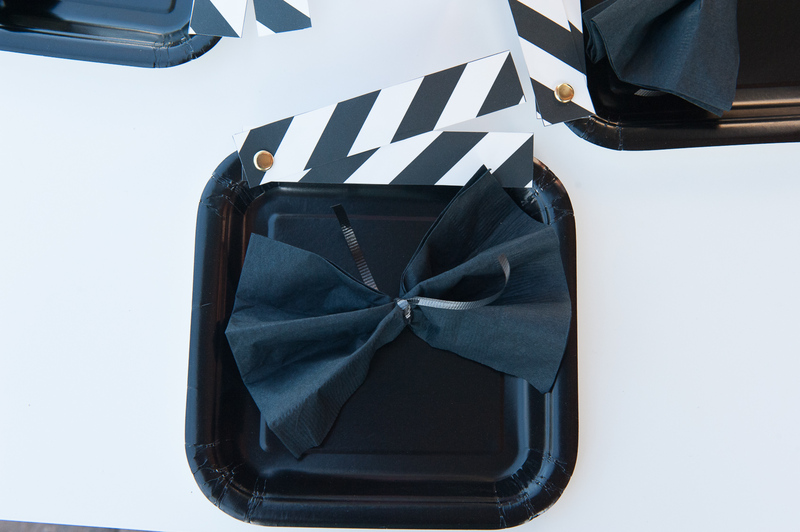 The table setting was created by using square black paper plates. Then we searched for an image of a director’s clip board, printed it out, and cut it to size. If you attach them with a brad fastener or clip to the top of the plate, you can make it function like an authentic director’s clapboard! The napkins can become bow ties when folded like an accordion and then tied with black ribbon. 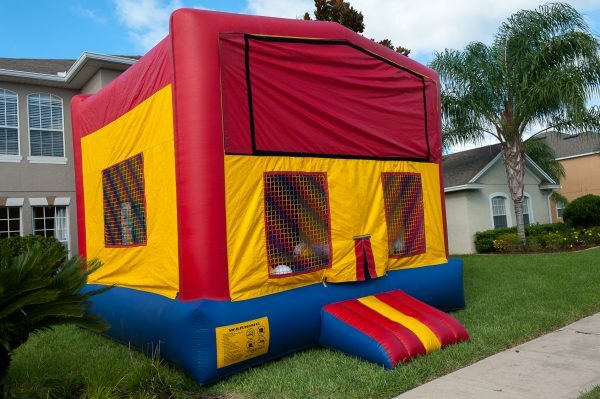 We rented a bounce house that acted as a popcorn popper! 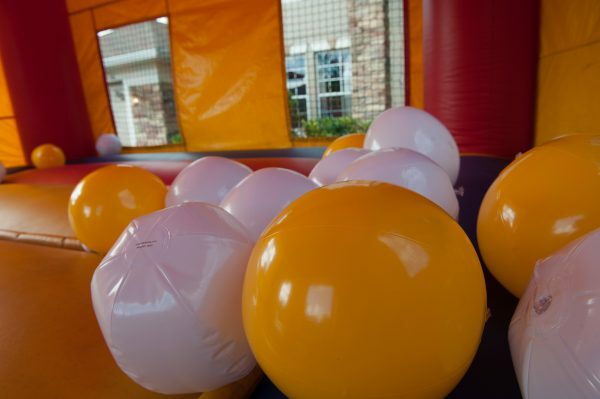 Inside of the bounce house, we added white and yellow balls that served as the popcorn, and audio that played popcorn popping. 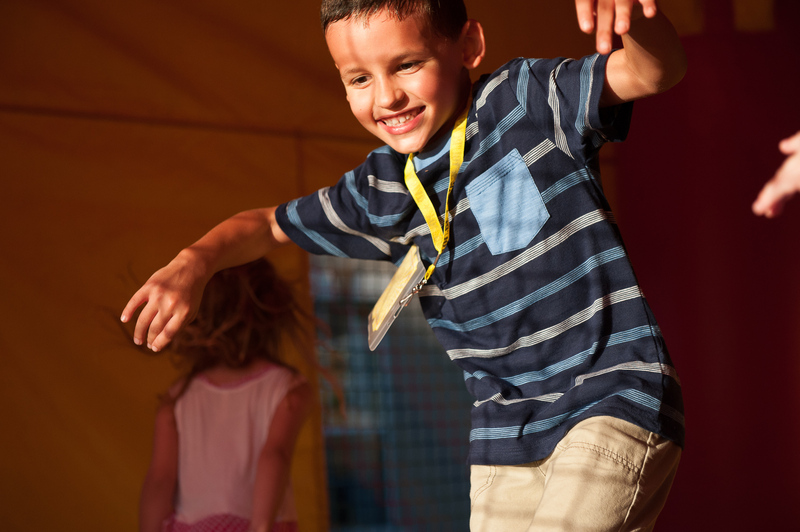 When the kids jumped in the bounce house, they became part of the popcorn popping! 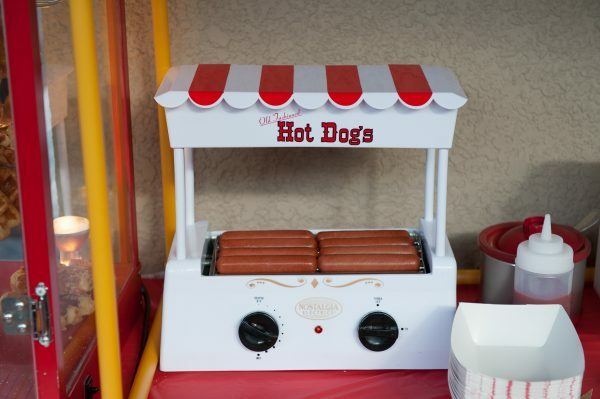 You could also add removable vinyl letters to the bounce house that spell Fresh Popcorn! 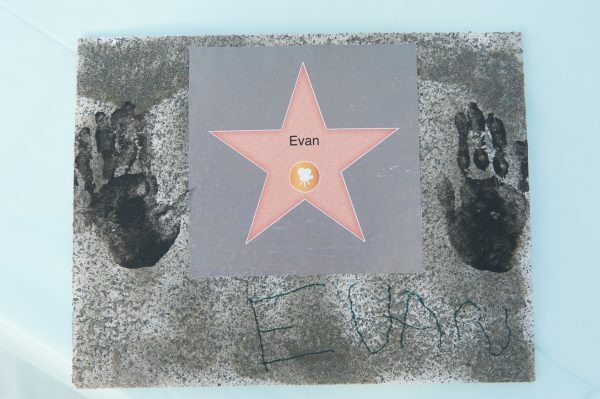 We used foam board to make this Hollywood Star craft. We printed out Hollywood stars with each child’s name. Then we spray-painted each foam board with a stone spray paint and let it dry. Mod Podge was used to attach the star on the foam board. 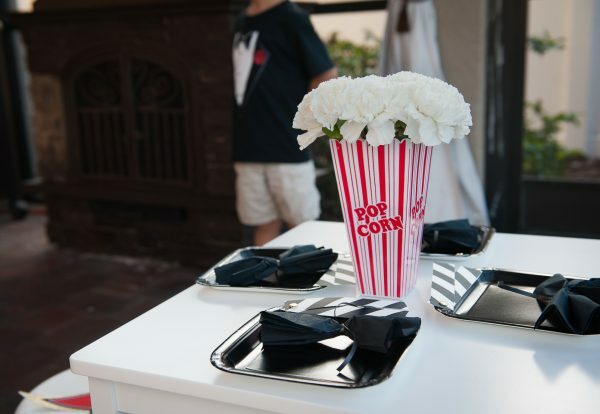 When the guests arrived, we put the washable black paint on their hands, and they placed their hands on the boards. We also had black markers so that the children could write their names of their boards. 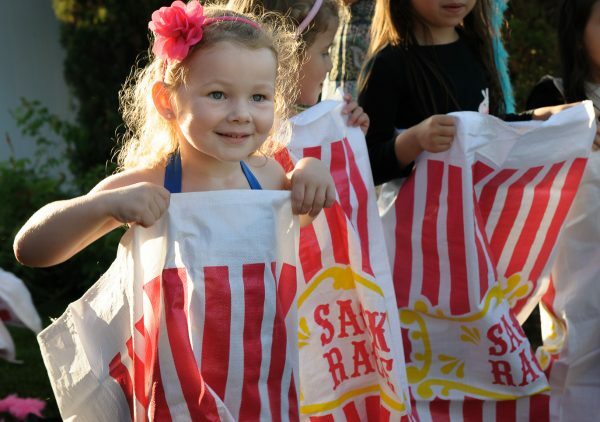 Round up potato sacks that look like popcorn buckets, and you’ll be all set for a potato sack race. Music videos that featured some of our guests (we used Jib Jab to make these videos). All the kids were so surprised to see their faces in the videos! 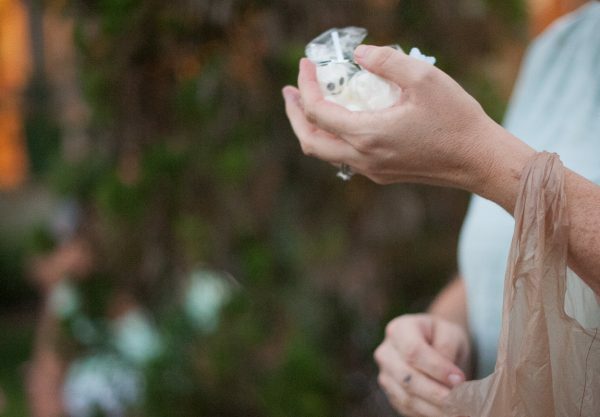 During the Frozen short we tossed tiny white snowmen to guests when the snowmen appeared in the movie. We made these out of small and large marshmallows and an edible black pen. It turns out when you cut marshmallows they will stick together. This is how we stuck together the large and small marshmallows together. 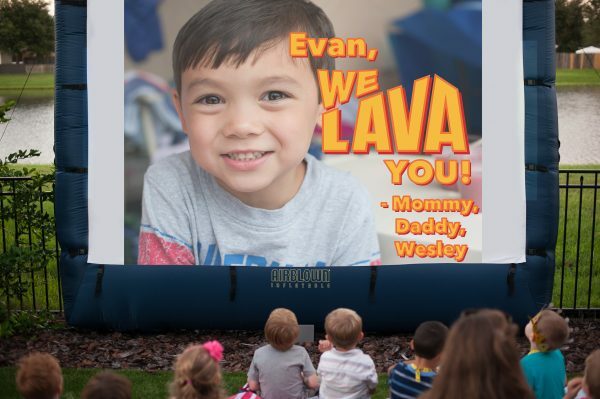 After the Lava movie, we showed this image to the guests. These cute Oscars had red rope Twizzlers candy attached with one of the printable images. 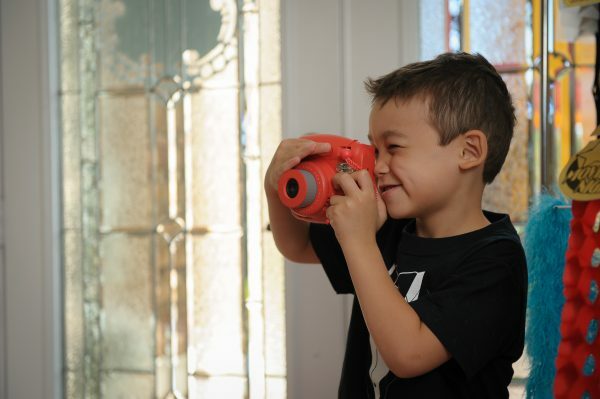 I especially liked seeing the pictures of the boys! Thanks! The boys had fun at the party. Wow! 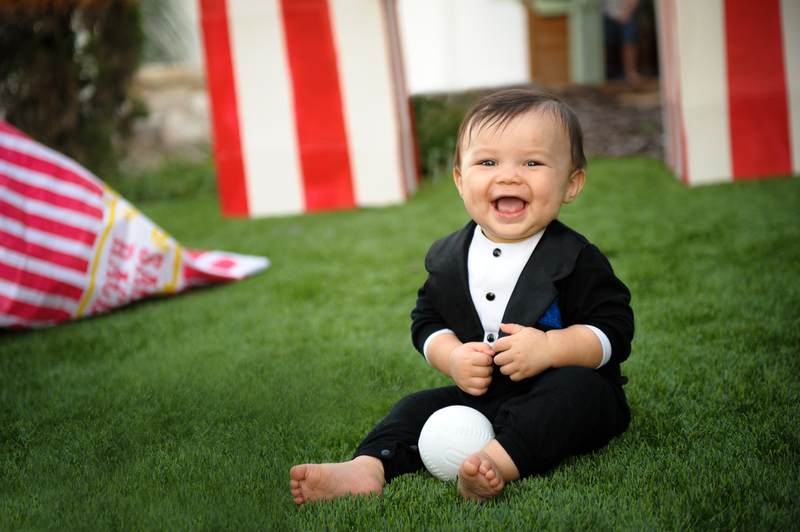 You really always go all out! I love all of the details. I don’t even know how you pull this off. So many cute things going on in this party! Thanks so much Lori! It’s always a lot of work but I enjoy every minute of it! Wow! What an extravagant party! Loved it all, from the invitation in a box (nice!) to the red carpet and balloon arch. 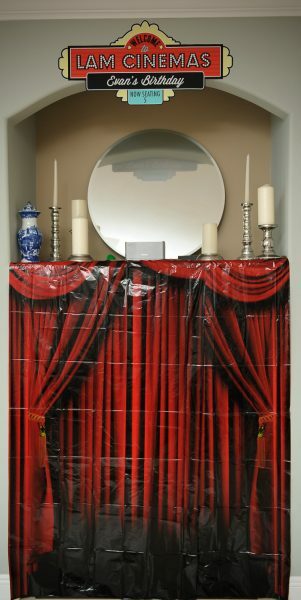 I did a movie party myself and just didn’t have time for all the ideas I had. Great job! Thanks Nathalie! The details are time consuming, but also a lot of fun. 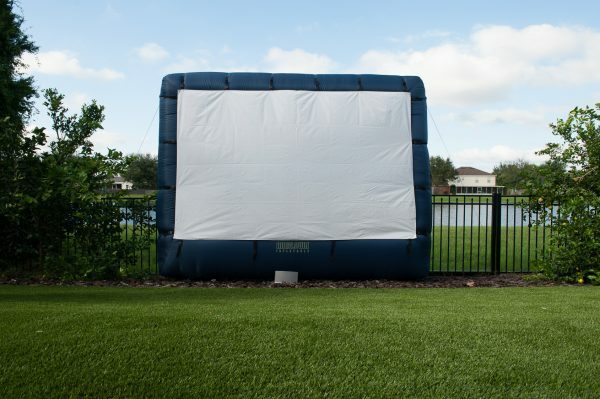 This movie night looks spectacular!! 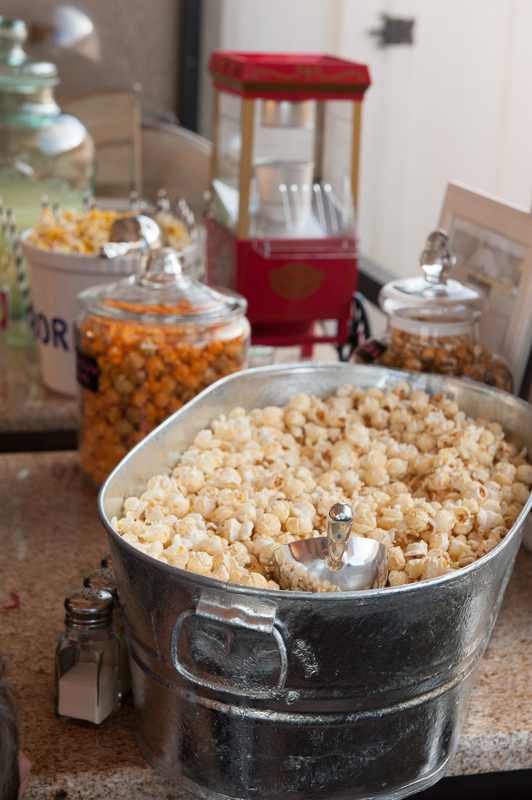 Having a popcorn bar is such a good idea. I love all the fun flavors! Thanks Sarina! 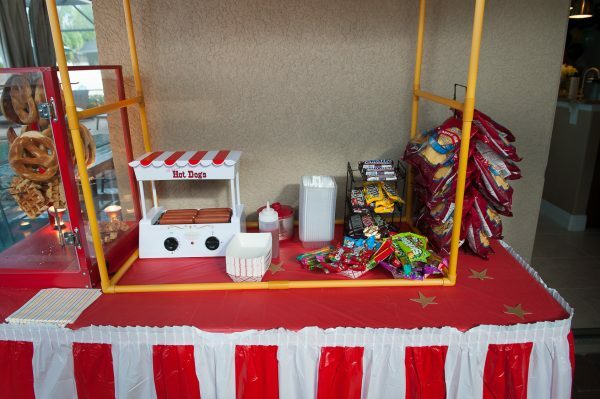 We really enjoyed creating all the details for this party. You thought of every detail! This was an amazing party. 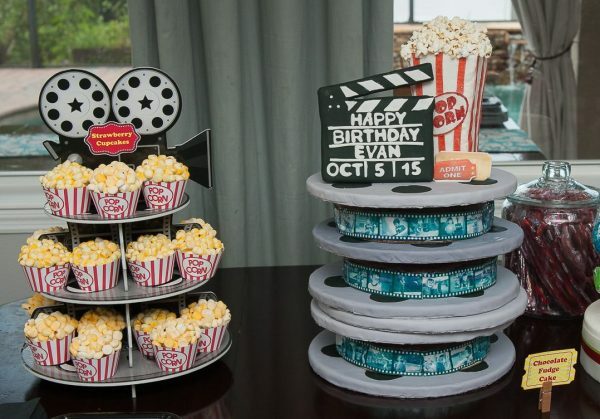 The film reel cake might be my favorite. 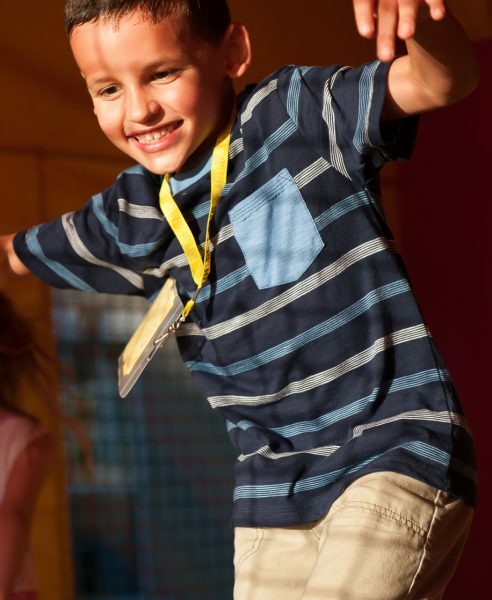 but there’s lots of fun stuff not to be missed. 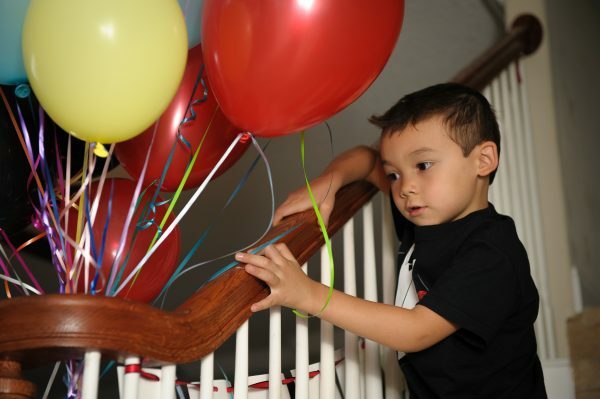 How on earth did you create that birthday video invitation!? It’s the coolest thing I’ve ever seen! Thanks, you’re so sweet Brianna. I’m more the creative and visionary and then when I have projects like the video invitation my geeky husband is a great help! To be honest, I’m not really sure how he did half of the video either. We did take out the sound for part of the video and then I was the voice of Elsa haha. The party looked like it turned out nice. Love all your ideas. Thanks for sharing.